Volunteering in our son’s outdoor kindie classroom over the past year been a treat. It’s great to have the opportunity to be active in our son’s education and, when we’re able, get into the classroom to help. Community walks are a blast. I’ve managed to go on a few and have heard rave reviews of others, including ravine walks; digging, planting and exploring in the Rail Garden; exploring nature and fun in Monarch Park. But, it’s also fantastic to experience the day-to-day of the kindie classroom. Every time I’ve volunteered has been a chance to connect with the school, teacher and other kids in our new community, and get a sense of what our son’s day is like. One particular volunteer day in January this year sticks in my mind. It was a very mild week, so the green space around Sandee’s classroom was particularly muddy. But, the kids came prepared with snow/rain paints, gloves, jackets and boots. 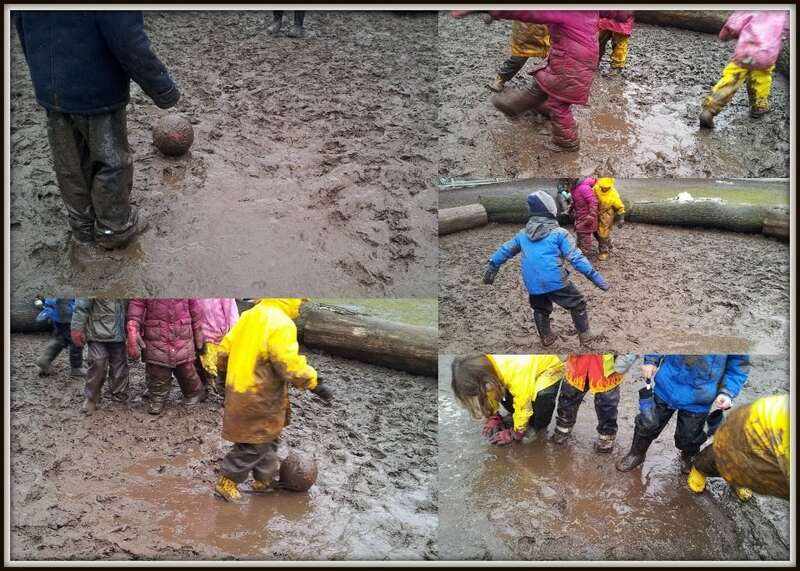 Before long, it was mud pies, boots stuck in mud, oozing mud between their gloved fingers. 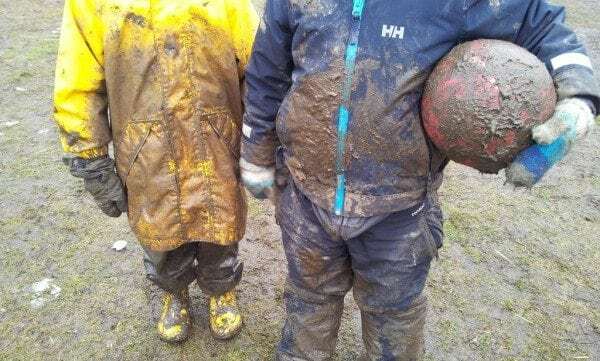 A celebration of mud. And that was before class even started! At Equinox, the pit is bordered by beautiful large tree trunks laid end to end to form a circle. In the middle? Dirt. Or, in this case, mud. Wet, sloppy mud. After we went over the very basic rules (the kids already knew, they were itching to get to it), the kindies had at it. Peels of laughter, pure joy, kids shouting encouragement to each other, competition, collaboration, kids slip sliding all over the place and on each other, incredibly orderly discussion of who got hit and was out for that round, intense cheering for the final players in a round until one of them won, huge celebration. And then everyone back into the pit for the game to begin again. Our supply teacher was a retired teacher who hadn’t been to Equinox before. At one point he stood, his mouth open, staring at the slippery, giggly, joyous muddy scene barely contained in the pit before us. He turned to talk to me. 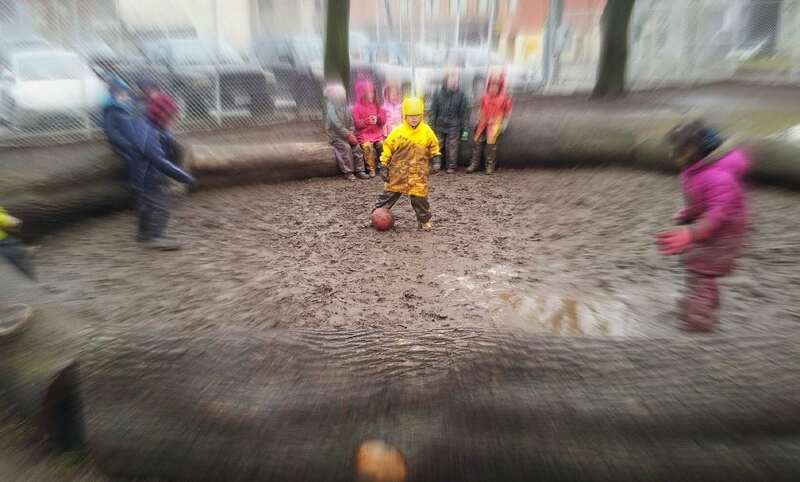 Kids getting covered with mud like this in the playground? No principal would allow it. This was unheard of. He said that his wife, also a teacher, would never believe him. This was incredible, unbelievable. You’d never see this at another school. We’re fundraising to make the outdoor kindergarten even better and would love your help! Equinox’s outdoor kindergarten classroom will be transformed into a magical discovery area, complete with woodland gardens, a water garden, sandbox, miniature streams, stepping stones and a variety of trees. Find out more.